The challenge was real. 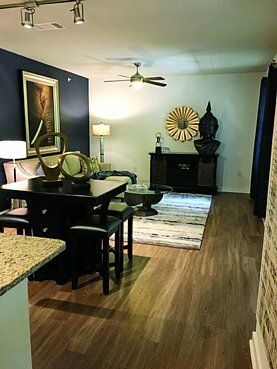 First, take 213 apartment units in the Barton Springs area of Austin and upgrade them to condominiums. Then, find an interior designer to create just the right look for eight model units to show prospective buyers. Check and check. And done it was. The project with this killer timeline was Zilkr on the Park Condominiums, about as close to Zilker Park as one can get — literally steps away from one of Austin’s most popular greenbelt neighborhoods. 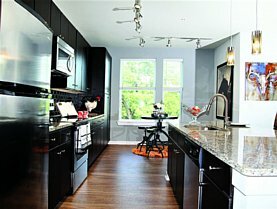 The former complex-turned-condos project was a mix of studio, one- and two-bedroom units ranging in size from 538 to 1,300 square feet. Anand enthusiastically dug in, mixing it up with four of the model units using variations on her own contemporary themes, with the other half featuring Western, European and Traditional styles. Her goal was to create a clean, airy ambience in each space that allowed viewers to picture themselves living there, and that meant striking a balance between not enough and too much. The condensed timeline also meant keeping it simple. In the dramatic Safari model, the open floor plan is shown to its best advantage by placing a dark espresso elevated dining table and stools from Target® to illustrate how the room doubles as a living/dining space. Behind the sofa is beautiful textured wallpaper from MDC Wallcoverings in Indigo; the dark blue is echoed across the room with textured velvet curtains from HomeGoods in Indigo. A gold finish mirror from Renwil Design hangs above the console table from Collectic Home. The wool area rug is from HomeGoods. The bedroom continues the drama with a touch of whimsy, courtesy of oversized gold resin lips from Renwil Design (“one of my favorite things to use,” says Anand), perched over the double bed with padded headboard and footboard from Rooms To Go. Walls are painted in off-white Aria, with an accent wall in Flagstone, both by Pittsburgh Paints. 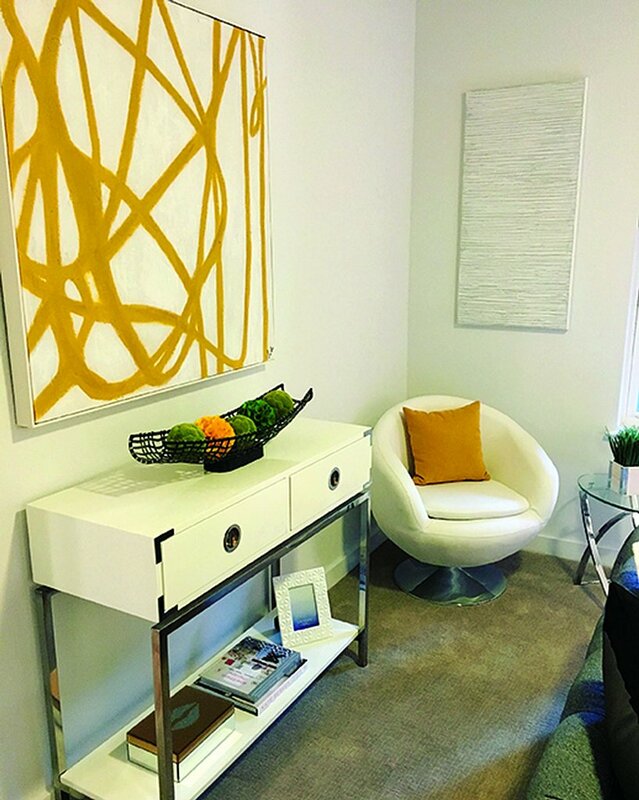 Abstract artwork sets off the corner of the room, where a modern chair from Eurway in white vinyl is right at home under a white-on-white print from HomeGoods. 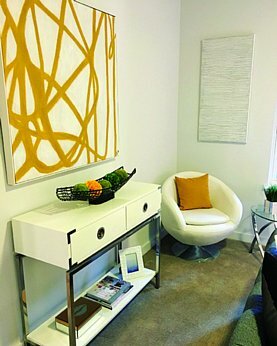 An abstract work in mustard and white from Renwil Design hangs over a white lacquer console table with chrome accents from New Pacific Direct (NPD) Furniture. In the Transitional Glam model, Anand capitalized on the abundant natural light in a unit that looks out to Barton Skyway. “This is an indoor building,” she says, “with indoor hallways and stairs, so I needed to switch out some of the fixtures to improve the lighting. People don’t often think to change lighting fixtures but it makes a big difference.” The white leather sofas are from Rooms To Go, and the two armless chairs were from the previous owner. The area rug is from HomeGoods. The Modern Glam model features “a lot of pinks,” but Anand kept that as a surprise element in the ultra-cool bedroom. The queen bed boasts plush bedding, serene on the outside — and neon pink on the inside. “I thought bright pink sheets would be a nice surprise from the predictable grey and white, and people seemed to like it.” The over bed wall art is from Renwil Design and plays off the metallic sheen of the bedding. The tufted ottoman is from TOV Furniture. Small spaces can be challenging, says Anand, but says the Zilkr project was “very fun, so much fun to experiment with different styles.” The project also let her exercise her downsizing chops, a subject on which she spoke at the Statesman ATX50 Speaker Series in October held at Zilkr on the Park — and a trend that’s here to stay.